Let's be a little newsy, shall we? You never know just how secret the Secret Service is until you pack up your weapons, load your pockets with 800 rounds of ammo and decide to run up to the White House and take a self-directed tour. Oh, buddy, what were you thinking? Omar G, You know that the Secret Service will tackle your hiney if you even give the President a little bit o' stink eye. 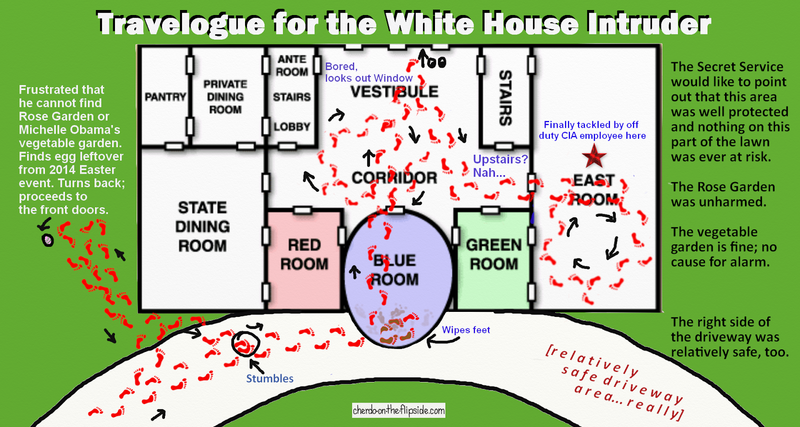 BREAKING NEWS: Apparently, the Secret Service will not tackle your hiney till you run across the lawn, over the porch, knock someone down, skip through the Blue Room...take a quick jaunt across the Corridor and the Vestibule...stroll past the stairs...and reach the East Room. But if you do that, THEN the Secret Service will be on you, man, with their best off duty officer. Take that! The Secret Service doesn't put up with your trifling antics. It's the White House. Show some respect! Okay, I'm going to beat this dead horse a little. This same guy, Omar J. Gonzalez, did get a little attention on August 25 when he was stopped along the White House fence - and was found to have a hatchet. Granted, he was on the right side of the fence, but a hatchet? Who does that? Federal Prosecutor David Mudd said he was not arrested at that time. Why not? Because he had a clean record, I'll bet. Dang it, the dude didn't have a clean record - he had run-ins with the law before. That stuff is written down, right? And the officers have an office with new fangled computer machines - right? Yet, he was allowed go on his merry way. Oh, shazzbat, this should be a different news story bullet point, but I can't get off this White House intruder. It is reported that officers who saw Gonzalez scale the fence determined that he didn't have weapons in his hands and that his clothing couldn't conceal "substantial quantities of explosives." Really, is that the only concern - that the dude might blow up? You're protecting the President and his family and, ahem, he was found to be carrying a knife. Though I haven't been trained as a law enforcement officer, I'm pretty sure you can hurt someone with a knife - I've watched CSI, Magnum P.I., Longmire...and Dexter. For crying out loud, I can't drop it... I seem to recall that I had to walk through a ridiculous number of metal detectors in the Capital building, and I don't have a record, actually wore a dress and pantyhose, AND I had an appointment. Why are the Secret Service officers just "eyeballing" White House lawn runners to determine risk? Okay, okay - I didn't technically have an appointment at the Capital...I was running with two other lobbyists trying to catch Moynihan and Sasser to bend their ears on a healthcare bill, back in the day. That doesn't make it better!! Trust me, I look absolutely insane running in heels, my face was red as a beet and I had to go through many, many metal detectors. Come to think of it, why did they trust me? This goes back much further than I thought. You know what information the Secret Service was able to access quickly? The fact that Julia Pierson was going down for this fiasco. I feel bad about that, because I'm thinking she wasn't the whole problem. Other things happened this week in the news...better bloggers than I will have to get to those items. The Secret Service agents were supposedly distracted because the President was getting in a plane, miles away or something like that. I would think we would have enough agents to handle both the plane situation and the White House at the same time! When you consider these guys are the best of the best...uh, yeah! I'm with you, Stephanie! I thought he'd just gotten on a helicopter right there at the front door of the White House. Where was attack dog Harper Junebug when they needed him? Like Omar J. Gonzalez, you seem to have an ax to grind. When I first laid eyes on your Travelogue for the White House Intruder it struck me that it would make a great board game - the perfect Christmas stocking stuffer! Families can have hours of fun rolling the dice, moving their tokens along the route, sending other players back to the gate, drawing a Chance card, etc. Caution: You do NOT want to land on a space that reads "Wrestled to the ground by SS agents. Go to jail. Go directly to jail and lose all carried and concealed weapons." To win, be the first player to wind your way through the maze of White House rooms until you reach the Oval Office where you will collect beer and pretzels and watch a Redskins game with Martin Sheen. Same happened to me, dear friend, only I was tackled, taken to an isolated room, strip searched and interrogated for hours. The most humiliating part of the ordeal was when they dumped the contents of my purse on the table and picked through it like vultures, looking for incriminating evidence. I had a heck of a time explaining the battery powered appliance I use to ease muscle tension in my face and neck. What could we call the board (bored) game? The Game of Strife? Brutes and Ladders? Checkers 2014, in honor of Richard M. Nixon? You're on to something, Shady. I'm making calls to Milton and Bradley. Seriously, Bradley is easier to deal with...just a tip. To ease tension in my face and neck, I pull out my battery operated Doggie Drone. Watchin' that little feller fly just makes me go "ahhhh." Sailing on a breeze, without a mechanical care in the world, helping little doggies everywhere. That's the life, I tell you. Wait till I get Harper Junebug his own prototype. Harper Junebug says he doesn't have time for such shenanigans. I hope you get this reference...if you've seen 'Monty Python and the Holy Grail' there was a scene where Sir Lancelot was running toward Swamp Castle. As he kept running and running, the guards just kept looking at him. They only said anything when he put his sword into one of them. The White House intruder reminded me of that (if you don't know what I'm talking about, I'm sure it's on You Tube. Pretty funny). Al, you've got to know that we are all over Monty Python, ha ha. That is right up our alley. Thanks!! It IS on You Tube. Monty Python - Endless Running. Check it out. It's pretty funny. Come to think of it, that may be the subject of a post. When we visited The White House, we went through a metal detector and they looked inside my purse. A very nice man also gave me the sweetest massage . . . sorry, I forgot the subject. Anyway, they let us in, and I wore pantyhose to a dinner theater earlier this year. I think it was my first pantyhose experience in about fifteen years. God help us all with the security of the United States in the hands of the Secret Service and NSA. X used to have security clearance so he could work at a national lab. He's as mad as a hatter. I'll never forget my first pantyhose experience. Jane: "...mad as a hatter. " Bwahahahaha. Pantyhose and I have since parted ways, but I'd don them again - if Shady does. And if Shady sings the Star Spangled Banner in 'em, I'll put my other leg in, do the Hokey Pokey and turn myself around. Really, that's what it's all about. Did you hear that the man who invented the Hokey Pokey died? His funeral was very difficult. They'd put his right leg in. He'd put his right leg out. Took hours to get him in the grave. I'm thinking this incident won't be on anyone's resume (and they will need one). I haven't been following the news too closely, but people told me about this. Just wow.